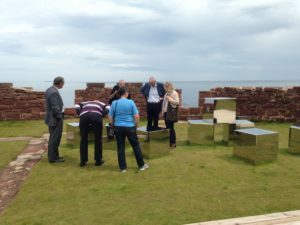 Battery Theatre Company - "Mary, It began with a lass..."
The directors of Viridor Credits visited Dunbar Battery on 14th June to see the results of the project that Viridor Credits had so generously funded. 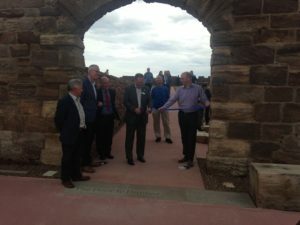 Trustee Steven Anderson has been at the helm of this project since its inception and he held the ribbon as it was cut. Also in the picture is Councillor Norman Hampshire who, together with East Lothian Council, have supported the project to its conclusion. Norman’s grandmother was born on Dunbar Battery, so this was a particularly special occasion for him. During the visit Donald Urquhart was able to explain the inspiration behind the Sea Cubes.